Mobile Physician Services strives to make sure all of our patients receive the proper health care and maintain a healthy lifestyle, specifically when it comes to heart- health.. By doing so, we would like to recognize the month of February as American Heart Month. American Heart Month was established because in the United States the leading cause of death is cardiovascular disease. For example, one in every three deaths are due to heart disease and stroke. There are many simple and easy ways to improve the health of your heart. One important step, to fighting back against heart disease, is to make every calorie count by eating a heart-healthy diet. A heart-healthy diet is high in vegetables, fresh fruits and avoiding foods that are high in sodium and trans-fat. Another equally important step to a healthy heart is to get the right amount of sleep and exercise for your age, as well as, cardiovascular testing. Simple exercises for people with limited mobility would range from light weight lifting to swimming. Many swimming pools and health clubs offer pool-therapy programs for wheelchair users and, if you have some leg function, a water aerobics class would be a great option. If you suffer from high blood pressure be sure to check your blood pressure before exercising and avoid exercises involving heavy weight lifting. Just by getting your blood pressure checked once a year can reduce your risk for heart disease or heart related problems. Mobile Physician Services provides the most efficient care to make sure our patients are healthy and more importantly heart-healthy. 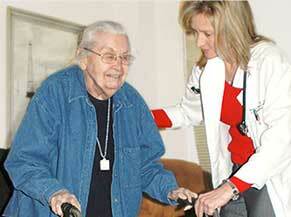 In the comfort of the patients’ home, we provide the proper testing and attention to prevent and treat heart disease. If you’re ready to take the first step to being heart-healthy you may contact Mobile Physician Services at 855-232-0644 or online at www.mobilephysicianservices.com.